Turns your network PCs into sophisticated Employee Information Kiosks and remote time entry stations. It’s the ideal solution for LAN, WAN and Internet-based time data collection. Our employee self-service module “infoPLUS” provides employees secure access to confidential information, including available benefit hours, paid hours-to-date, and attendance data; as well as the ability to view (and modify if permissions are given) schedules and time sheets/cards. After review, infoPLUS can be structured with an electronic time card approval option. With the use of the self-service module, employees have instant access to system data, eliminating the need for supervisors to get involved to answer such questions. The employee self-service module allows you to provide any KPI (Key Point of Interest) to the employee. Information such as Time Cards, Hours, Schedules, Exceptions and Attendance Points are just a few of the TrakIts available. We can even assist in creating custom TrakIts with your own KPIs for your unique needs. Employees have access to their information in Real time. Powered by our TrakIt® Technology, we can provide important KPIs (Key Points of Interest) to the employee. Turns your network PCs into sophisticated Employee Information Kiosks and remote time entry stations. It’s the ideal solution for LAN, WAN and Internet-based time data collection. 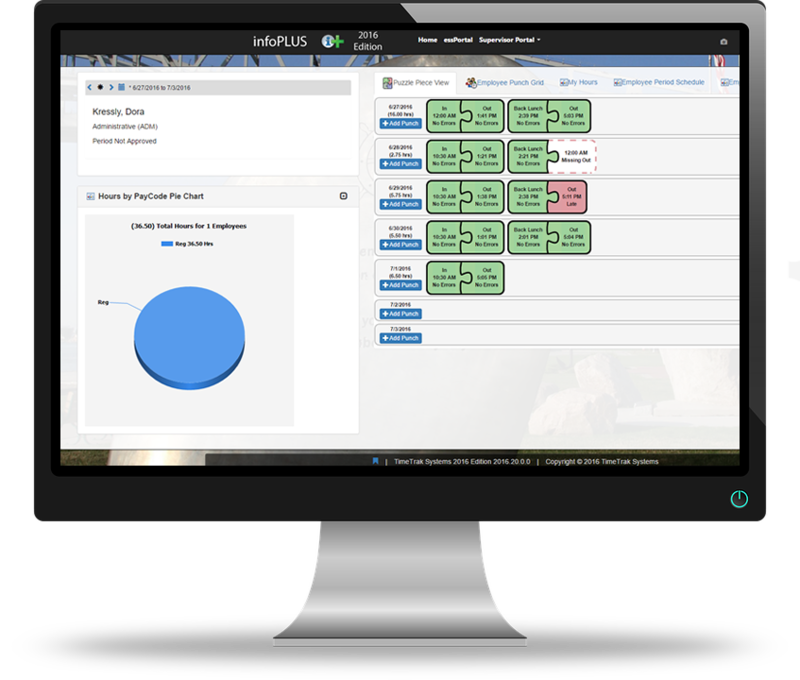 Our employee self-service module “infoPLUS” provides employees secure access to confidential information, including available benefit hours, paid hours-to-date, schedules, time cards data, as well as review of hours and attendance data. Employees have access to their information in real time. Access to time cards, hours, schedules and attendance information is just a click away.